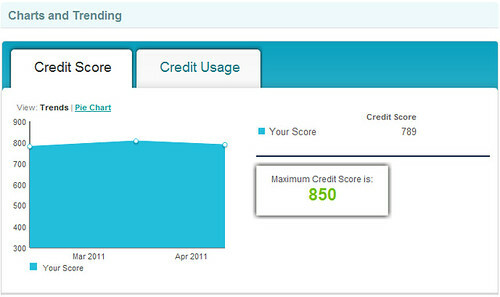 Credit Sesame provides Experian credit score and other money saving advice to its customers totally free. Do you check your credit score regularly? If so, what service do you use? Paid credit monitoring services or free services such as Credit Karma? I have thought about using a paid service before, but ended up using Credit Karma instead because 1) it’s free, 2) my score is rather stable so I don’t need to keep an eye on it everyday (Credit Karma updates credit score every month). In addition to free credit score, I also get free credit reports every four months from annualcreditreport.com to monitor the accuracy of my credit. With both the free credit score and reports I got, I don’t think it’s necessary to pay for credit monitoring. Besides, nowadays there are more and more ways to get credit score for free, so the need for a paid service isn’t that high at all, even though once in a while I did pay to get a FICO score to see where I am at on the 300 to 850 scale. Among websites that offers free credit score, Credit Sesame is a new comer, but the services its provides to its customers are rather comprehensive. The way Credit Sesame works is similar to what Credit Karma does: you sign up with Credit Sesame for free and by agreeing to provide your Social Security Number and allowing Credit Sesame to run your credit, you will receive a free credit score provided by Experian (Credit Karma uses TransUnion for its credit score offering, see Credit Karma vs Credit Sesame for more details about their differences). When Credit Sesame runs your credit, it also analyzes your debts and comes up with advices for where and how you can cut down your monthly payment and save money. Since the service is totally free, the sign-up process is extremely simple. However, as mentioned above, if you want Credit Sesame to check and update your credit score, as well as all your debt information, you will need to provide your SSN. Otherwise, you can still use the free service by manually entering your own data, such as your credit score and how much balance you have on your credit cards and mortgage. Of course, you will have to do the manual update every time if you want to see analysis from Credit Sesame. I hesitated about giving my SSN when I first knew Credit Karma, but now I am quite comfortable with it after seeing it improved in the past couple of years. So for Credit Sesame, I decided to give it try from the beginning. From the above screenshot, you can see that in addition to credit score, Credit Sesame also pulled loan and debt information from my credit report, including mortgage and credit card balance (it separates credit cards into Credit Cards and Store Cards), and used that information to calculate my monthly payment, then ran 8,093 19,196 scenarios (the number of scenarios have more than doubled since I first used it three months ago, so Credit Sesame is definitely expanding its offerings) to provide advice on how I can save money. While both Credit Karma and Credit Sesame their customers to update their scores at any time, Credit Sesame does it automatically. As soon as you logged into your Credit Sesame account, it starts recalculating your score and running the scenarios automatically. Once the process is done, all you see in your account is updated information. With Credit Karma, on the other hand, you will have to click the update button to manually start the update. Both Credit Karma and Credit Sesame keep a record of your credit score so you know how it changed over time. No, Credit Sesame doesn’t provide any loan service itself, it does, however, partner with other mortgage lenders to offer loans to its customers, whether it’s for new purchase or refinance. 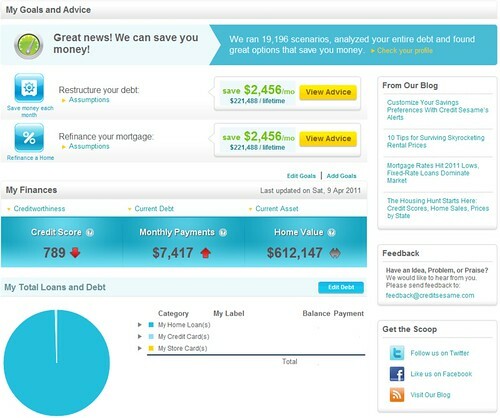 And this is how Credit Sesame can keep providing credit scores and other services for free. Even though I am fully aware of my loan and credit card balances, which I pay in full every month, I still clicked the money saving advices Credit Sesame provided to see what they got for me. 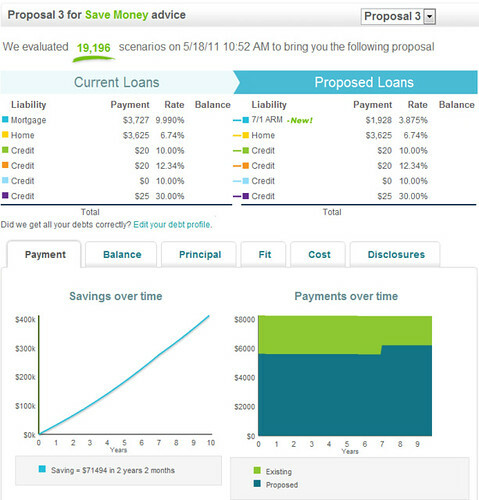 As mentioned above, Credit Sesame runs some 19,196 different scenarios to find the best ways to save money, whether it’s for credit card debt or home mortgage, and those scenarios are presented in three proposals at the end. The biggest debt we have right now is our 15-year fixed rate mortgage at 3.875% APR (somehow, Credit Sesame still considers the loan that we refinanced last October as an outstanding loan, which isn’t correct of course). And the rate, 6.74%, isn’t correct either. The reason for this error, from my guess, is that our lender is required (by Virgina law?) to collect property tax and home insurance each month and put them in the escrow account. If property tax, home insurance and principals and interested are all used to calculate the loan rate, the result can’t be right. And when the rate is wrong, the proposed monthly saving is wrong as well. Anyway, in one of the proposals presented to me, Credit Sesame recommended replacing the loan with a 7/1 ARM that has the same rate as we currently have. Of course, the reason we got a 15-year loan instead of a 30-year one in the first place is to save money over the loan period. Yes, we could pay less every month with an ARM, but I doubt we will end up winning with a 7/1 ARM as suggest, not with the rate we have anyway. Do you want to try Credit Sesame? Thanks a lot for your useful information and hope to read more from you. The link for myfico is different to when i google it? is this correct? please verify and get back to me. thanks! The writer mentioned that Credit Sesame “pulls” the credit information from Experian. Does this mean that there is an ‘inquiry’ on my credit report from this “pull” if I use Credit Sesame?